Our Buena Vista Zipline Course is open May-Sept each year. 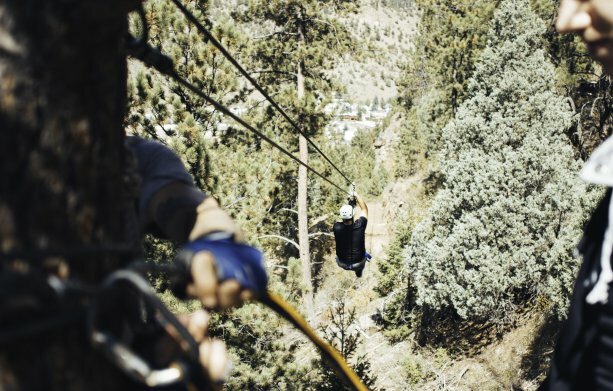 Come fly among the trees at our zipline course located in Buena Vista, Colorado just 2.5 hours from Denver and 1 hour from Breckenridge, Vail or Aspen. You will enjoy spectacular views of snowcapped peaks and the mighty Arkansas River. Our course is located on 44 acres of undeveloped mountainside land and our platforms are built into the natural elements such as rock outcroppings and trees. Located on our outpost 14 miles north of Buena Vista, on 44 acres of private, mountain hillside adjacent to the Collegiate Peaks Wilderness Area. Our zipline course is integrated into the wooded and craggy surroundings of our mountainous 44-acre Gold Camp property. Take in the views of snow-capped peaks and the Arkansas River as you zip from cliff to cliff between the pine and aspen trees. This trip departs from our Buena Vista Outpost. Multiple departure times available each day. Visitors Rated 4.5/5.0 based on 599 ratings for Mountaintop Ziplining Tour in Buena Vista. Two of Colorado’s absolute best adventures in one action-packed day. After rafting America’s favorite stretch of whitewater, sit back and enjoy a fajita lunch at our Buena Vista outpost before taking your next adventure through the Mountaintop Zipline course. Our ziplining course is within the wooded surroundings of our mountainous 44 acre Gold Camp property. You will take in views of snowcapped peaks and the famed Arkansas River as you zip from cliff to cliff among towering pine and Aspen trees. Spend 2 days with Colorado Zipline as we show you some of the best parts of Colorado. Start the day with the full day Browns Canyon Sizzler whitewater rafting trip on America’s favorite stretch of the Arkansas River. Experience an action-packed day of some of the best Class III rapids followed by an evening in the AVA campground (dinner provided). Wake up the next morning to a full breakfast spread then head to our Mountaintop Zipline for a tour through our 44-acre Gold Camp property. Get ready to feel the wind in your hair as you travel at speeds of up to 30 mph! This is the perfect way to experience the Arkansas River from within the canyon walls and above through the trees. If one day isn’t going to satisfy your need for adventure, then come spend the night with us too! Begin your adventure with a breathtaking view of the Arkansas Valley area and the Arkansas River from up above as you soar through our densely wooded Gold Camp property. Check out the nearby snow covered mountain peaks as you reach speeds of up to 30 mph. After a short break for lunch, get ready for a pulse racing afternoon of Class III rapids through the Arkansas River’s famous Browns Canyon. Once in the canyon, you will set up camp for the night and get ready for dinner. Once you’ve had your morning coffee, we’ll head through the rest of the canyon for the last leg of your adventure trip. Combine these two popular Colorado summer mountain activities for an day full of action! Begin the day with the famous Class IV section of the Arkansas River called The Numbers. The Numbers is known for its continuous whitewater action and steep drops that are sure to leave your heart pounding. Next, we will take a short break for lunch so you can refuel for an afternoon soaring through the trees. The zipline will have you flying from one cliff to the next over our beautiful 44-acre Gold Camp property. Take in the peaceful snow-capped mountain tops and see what unique Colorado wildlife you can find while reaching speeds of up to 30 mph. This day will have you coming back for more! Enjoy a day full of non-stop Class III/IV rapids as you barrel through the notorious Numbers and Narrows sections of the Arkansas River. With its steep drops and continuous obstacles, you’ll forget everything you left behind. After a hot riverside chicken fajita lunch, you’ll conquer the Narrows section before returning to the outpost for dinner and a night under the stars at the AVA campground. Wake up the next morning to a delicious breakfast to prepare you for another thrill-seeking adventure. Our mountaintop zipline tour is sure to have you hooked on ziplining. Sail over our beautiful 44-acre Gold Camp property while taking in the mountainous scenery that surrounds you. You’ll soon see why ziplining has become one of Colorado’s new most popular outdoor adventure activity. What do you get when you combine our Class V whitewater rafting trip with an exhilarating zipline tour through our mountainous tree-filled property? A non-stop, heart-pumping 2 days filled with some of Colorado’s favorite summer mountain activities! Join us for a day on the water as you charge through the Pine Creek section of the Arkansas River. Get acclimated to the paddle strokes as you float through the beautiful Granite Gorge. But don’t be fooled, just around the corner is your first rapid where you will drop 200 feet as the river narrows to half its width. Continue the day with many more Class IV/V rapids and a riverside chicken fajita lunch before coming back to the outpost for an evening at the AVA campground (dinner included). Wake up the next morning to a full breakfast spread before you check out another outdoor adventure activity. Be amazed at the incredible mountain scenery as you sail through the skies at speeds of up to 30 mph on our zipline course! Who wouldn’t want to end their action-packed day by jumping cliff to cliff and soaring through the trees?